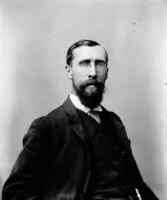 FENETY, GEORGE EDWARD, newspaperman, office holder, author, and politician; b. 10 March 1812 in Halifax, fourth son of William Fenerty, a draftsman and architect, and Mary Hall; m. first — Wallace, who died in childbirth; m. secondly 30 Sept. 1847 Eliza Ann Arthur in New York City, and they had seven sons and four daughters; d. 30 Sept. 1899 in Fredericton. George Edward Fenety attended Halifax schools for several years until at 17 he began his apprenticeship under Joseph Howe* at the Novascotian, or Colonial Herald. He learned more than the newspaper trade; during those five or six years he absorbed Howe’s political attitudes and zeal for reform, as his later career would demonstrate. In November 1835 Fenety left for New York City. A year later at Donaldsonville, La, he took a position on the Planters’ Advocate, of which he soon became part-owner and assistant editor. His experiences with the Jacksonian mystique in the United States were to stay with him after he sold out his share in the paper in 1839 and moved to Saint John, N.B. Assisted by his brother William, on 16 Sept. 1839 he started the tri-weekly Commercial News and General Advertiser, the first penny paper in the Maritimes. The penny paper, wrote Fenety, was “the poor man’s friend.” The Commercial News carried echoes of the common man’s struggle against repression. Indeed, Fenety considered himself among the common men, being his own type-setter, pressman, and editor. Despite the competition of the established weeklies, he survived. Within four months he introduced a new type-face, and on 3 April 1840 he enlarged the paper and changed its name to the Morning News. It carried local stories and international news along with some fiction. Fenety was not a great stylist or editor: everything was rushed and rough. To him it was ideas that counted. He looked in vain in New Brunswick for the reformers and the political parties that characterized Nova Scotia and the United States. In the sister colony, he later wrote, the press, “in the hands of able men, was continually busy in educating the country.” He stepped into that void. He took as the motto of his newspaper “Reform and Responsible Government,” which to him meant almost total independence from England and freedom from oligarchic rule in the colony. In political matters he wanted a broader franchise, vote by ballot, municipal institutions, and initiation of money bills by the executive rather than by individual assemblymen. On the social side he was for the underdog. He saw public schools, and education for black children (who had been excluded from the schools of the city), as essential. He wanted improved conditions for workers and he supported temperance, a favourite reform among the low-church Anglicans of Saint John, of whom he was one. Fenety became a Saint John “booster,” railing against the Common Council and its failure to improve conditions in the city, from the garbage dump at King Square to the water system. 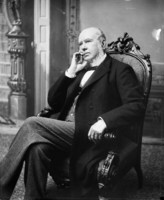 He joined the Saint John Mechanics’ Institute, which included most leading men of the community, and he was part of the Rail-Way League in 1849 which sought a line from Saint John, first to Shediac and later to Maine. For a while his newspaper was called the Morning News and New Brunswick Railway Advocate. From the beginning Fenety concentrated on the activities of the House of Assembly in Fredericton, carrying debates and commentaries three times a week when the house was sitting. The Morning News quickly acquired the largest readership in the province, although its circulation was limited to the southern counties. The good businessman and journalist in Fenety kept the News ahead of the competition into the 1860s through aggressive reporting from a network of correspondents and through the continuous upgrading of his plant. 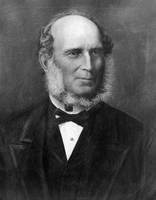 In 1847, for example, he had a telegraph line from Fredericton installed. By 1857 his weekly circulation had risen from 500, its initial run, to almost 8,000. Through Tilley, in 1857 Fenety was appointed to a commission that recommended improvements in the administration of the provincial asylum, penitentiary, marine hospital, and lighthouses. 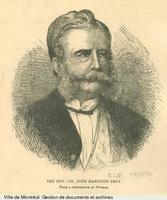 When Tilley became premier in 1861 the Morning News was regarded as his mouthpiece and in February 1863 Tilley had Fenety appointed queen’s printer, a position he was to retain tenaciously until 1895. Having moved to Fredericton as queen’s printer, he sold the Morning News in 1865 to Edward Willis and two others, but he would never become a quiet civil servant. 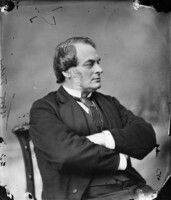 He campaigned for confederation in the mid 1860s, and in the 1880s he opposed imperial federation just as strongly, publishing a pamphlet in 1888 on the impracticability of the scheme. Fenety appears to have become content in Fredericton, though his stay began with a series of tragedies including the death of three of his children and his mother. With his wife and remaining children he moved to a large property which he christened Linden Hall. Directly across from the Church of England cathedral, it became a local landmark, especially after he entered municipal politics. He was elected mayor in 1877 just as the city moved into its new hall. The installation that year of a new clock and bell worth $2,320.62 moved him to donate his annual stipend of $200 towards their cost. After Fenety was defeated by three votes in January 1878, Professor George Eulas Foster* of the University of New Brunswick presented him with a $250 silver-plated epergne on behalf of appreciative citizens. Fenety then wrote The city hall clock . . . (Fredericton, 1878), a pamphlet addressed to the citizens. In January 1884 he was again elected mayor, and he was unopposed in the next three elections. He did not run in 1888. The beautification of Fredericton was his main concern, and he spent his own money on public projects such as the planting of trees and the construction of a fountain in front of the city hall. In addition to his various pamphlets Fenety wrote several books. In 1842 at Halifax he published The lady and the dress-maker; or, a peep at fashionable folly . . . , an undistinguished novel about an event in Saint John. 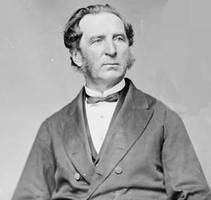 His major work, which is still consulted, was Political notes and observations; or, a glance at the leading measures that have been introduced and discussed in the House of Assembly of New Brunswick . . . (Fredericton, 1867). Since the provincial debates were not published, Fenety provided his version by returning to the Morning News files. From them he compiled a scissors-and-paste text for the period 1842–54, interspersed with his own notions on reform and responsible government. The sequel, extending the work to 1860, appeared as a newspaper column in the Saint John Progress in 1894. During his retirement he put together the Life and times of the Hon. 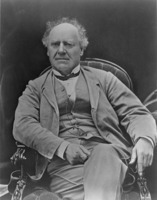 Joseph Howe . . . (Saint John, 1896), a flawed study of his former mentor. With Fenety’s death in 1899 after a short illness, Fredericton lost one of its “best known and most highly esteemed citizens,” according to the St. John Daily Sun. He had served the community in various organizations, including the school board, the historical society, the board of health, and the Fredericton Society for the Prevention of Cruelty to Animals. Through the Morning News he had not only changed the nature of the newspaper business in New Brunswick, but had been part of a successful political reform movement. He is remembered as the most notable newspaperman of his time in the province. The second part of Fenety’s Political notes and observations appeared in the Progress (Saint John, N.B. ), 6 Jan.–7 July 1894, under the title “Political notes: a glance at the leading measures carried in the House of Assembly of New Brunswick, from the year 1854.” The columns were collected into a scrapbook (Fredericton, 1894), copies of which are in the N.B. Museum and the NA Library; the scrapbook is also available on microfiche as CIHM, ser. no.06725. In addition to Fenety’s pamphlets, books, and newspaper, the sources listed below were useful in the preparation of this article. NA, MG 24, B29; MG 27, I, D15. N.B. Museum, Tilley family papers. St. John Daily Sun, 9 Jan. 1885, 12 Jan. 1886, 11 Jan. 1887, 4 Jan. 1888, 2 Oct. 1899. Standard dict. of Canadian biog. (Roberts and Tunnell), vol.2. C. M. Wallace, “Saint John boosters and the railroads in mid-nineteenth century,” Acadiensis (Fredericton), 6 (1976–77), no.1: 71–91. C. M. Wallace, “FENETY, GEORGE EDWARD,” in Dictionary of Canadian Biography, vol. 12, University of Toronto/Université Laval, 2003–, accessed April 21, 2019, http://www.biographi.ca/en/bio/fenety_george_edward_12E.html.